Elections likely after Finance Minister Moshe Kahlon tells Netanyahu he will not accept Bennett serving as Defense Minister. Kulanu party leader Moshe Kahlon told Prime Minister Netanyahu that he will not accept Jewish Home Chairman Naftali Bennett serving as defense minister, following the resignation of current defense minister, Avigdor Liberman. 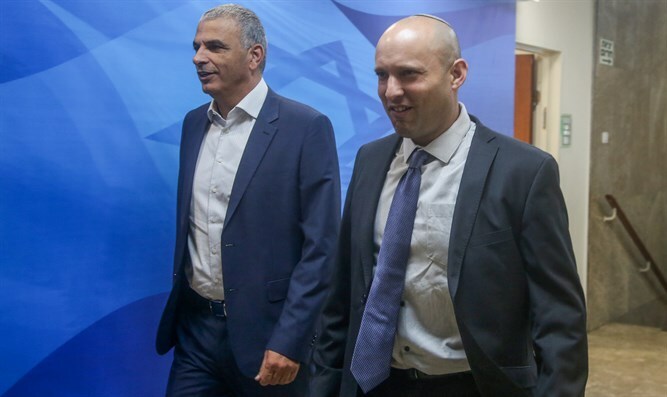 On Wednesday, Bennett issued an ultimatum to the Prime Minister, saying his Jewish Home faction will quit the coalition if he is not appointed defense minister. If Bennett's ultimatum holds, Kahlon's veto likely signals that early elections are on the way. "Bennett doesn't have it coming to get the Defense Ministry portfolio. I'm opposed to it," Kahlon told Netanyahu. Bennett told confidants in response that he will not accept any other portfolio. "I will not agree to compromises. Not the Foreign Ministry or anything else - only defense," he said. The Netanyahu government currently holds a 66-seat majority in the 120 member Knesset. With Yisrael Beytenu’s departure, that majority has now been reduced to just 61 seats.